Re: Case No. 06-111; Ann Thomas, D.V.M. 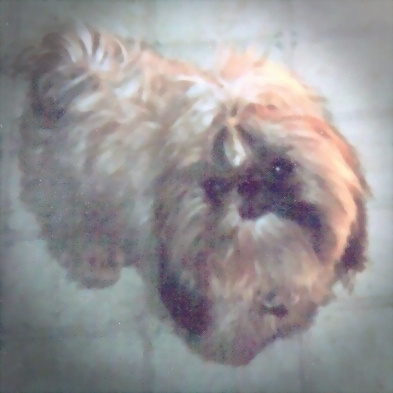 Please accept our condolences for the loss of "Stempy." 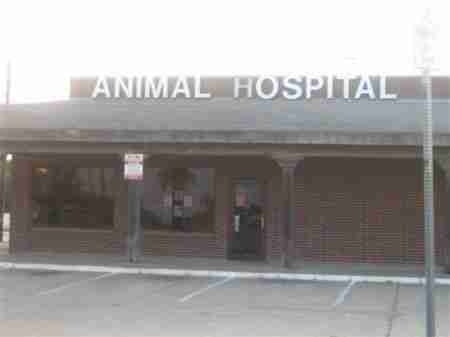 At your request, the Board had a third veterinarian review your complaint against Ann Thomas, D.V.M. 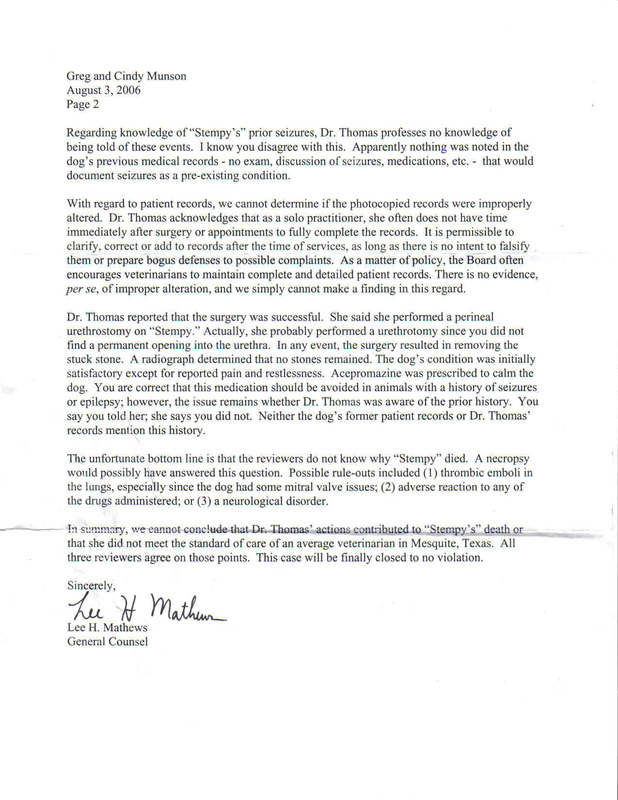 The reviewing veterinarian agrees with the other two in finding that Dr. Thomas (the "respondent veterinarian") did not violate the prevailing standard of care in diagnosing and treating "Stempy." Although I did not discuss in detail with the reviewing veterinarians the reasons for their conclusion, the following factors may have been considered. 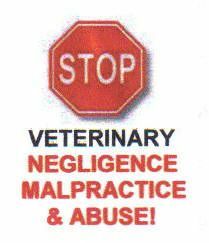 In any review of a complaint, the reviewers try to focus on the "big picture," that is, whether the veterinarian's actions or inactions, taken in totality, clearly violate the approach an average veterinarian in the same or similar community would have taken, given similar facts. 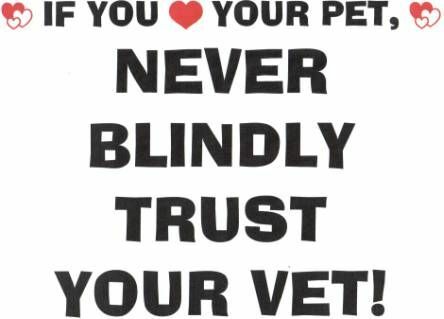 Keep in mind that a reviewing veterinarian may conclude that he would have done some things differently, but this does not mean that the respondent veterinarian violated the standard of care by doing things her way. The standard of care can be multi-faceted. Remember also that the respondent veterinarian's recollection of events may sharply disagree with the complainant's. This makes it extremely difficult to sort out the facts in many cases. 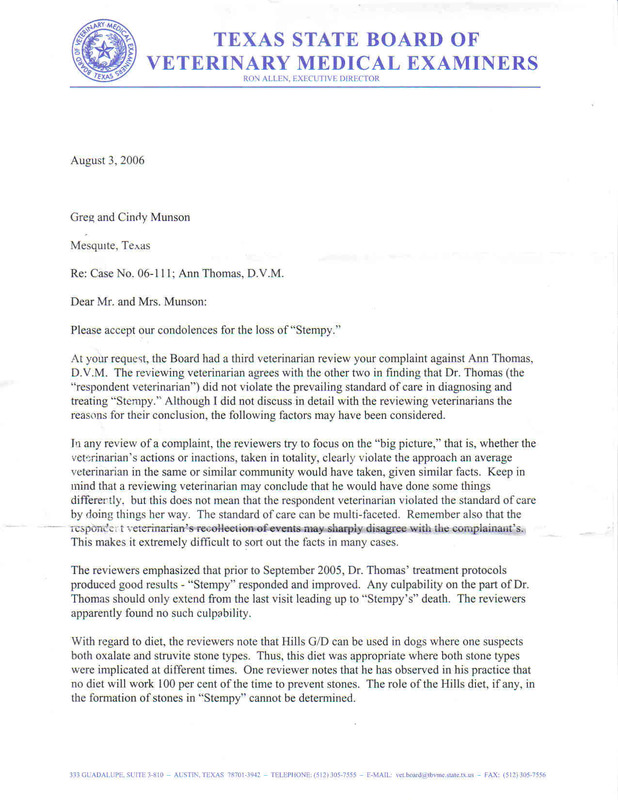 The reviewers emphasized that prior to September 2005, Dr. Thomas' treatment protocols produced good results - "Stempy" responded and improved. Any culpability on the part of Dr. Thomas should only extend from the last visit leading up to "Stempy's" death. The reviewers apparently found no such culpability. 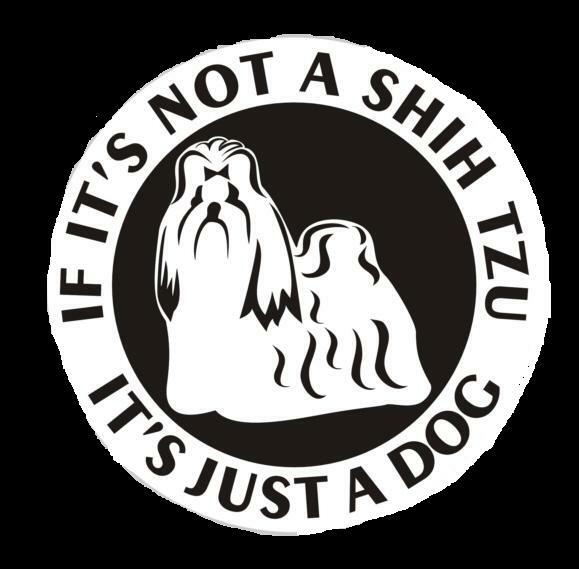 With regard to diet, the reviewers note that Hills G/D can be used in dogs where one suspects both oxalate and struvite stone types. Thus, this diet was appropriate where both stone types were implicated at different times. One reviewer notes that he has observed in his practice that no diet will work 100 per cent of the time to prevent stones. The role of the Hills diet, if any, in the formation of stones in "Stempy" cannot be determined. Regarding knowledge of "Stempy's" prior seizures, Dr. Thomas professes no knowledge of being told of these events. I know you disagree with this. 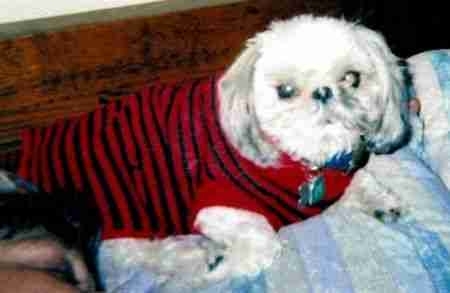 Apparently nothing was noted in the dog's previous medical records - no exam, discussion of seizures, medications, etc. - that would document seizures as a pre-existing condition. With regard to patient records, we cannot determine if the photocopied records were improperly altered. Dr. Thomas acknowledges that as a solo practitioner, she often does not have time immediately after surgery or appointments to fully complete the records. It is permissible to clarify, correct or add to records after the time of services, as long as there is no intent to falsify them or prepare bogus defenses to possible complaints. 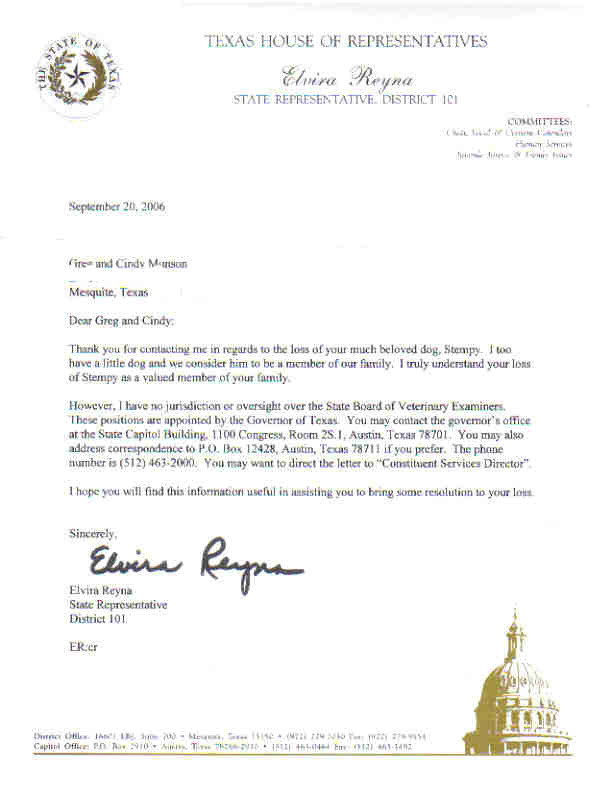 As a matter of policy, the Board often encourages veterinarians to maintain complete and detailed patient records. There is no evidence, per se, of improper alteration, and we simply cannot make a finding in this regard. Dr. Thomas reported that the surgery was successful. She said she performed a perineal urethrostomy on "Stempy." Actually, she probably performed a urethrotomy since you did not find a permanent opening into the urethra. In any event, the surgery resulted in removing the stuck stone. A radiograph determined that no stones remained. The dog's condition was initially satisfactory except for reported pain and restlessness. 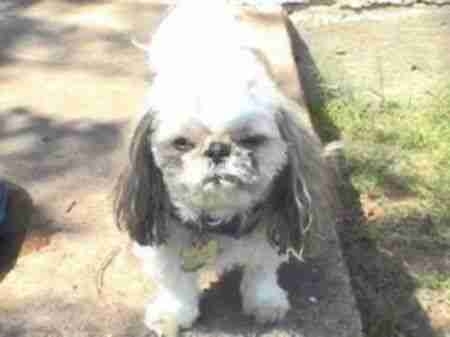 Acepromazine was prescribed to calm the dog. 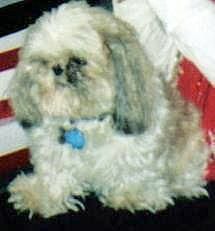 You are correct that this medication should be avoided in animals with a history of seizures or epilepsy; however the issue remains whether Dr. Thomas was aware of the prior history. You say you told her; she says you did not. 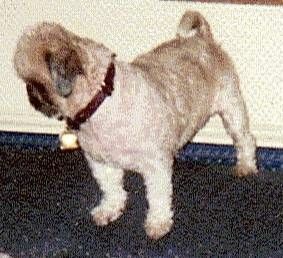 Neither the dog's former patient records or Dr. Thomas' records mention this history. The unfortunate bottom line is that the reviewers do not know why "Stempy" died. A necropsy would possibly have answered this question. 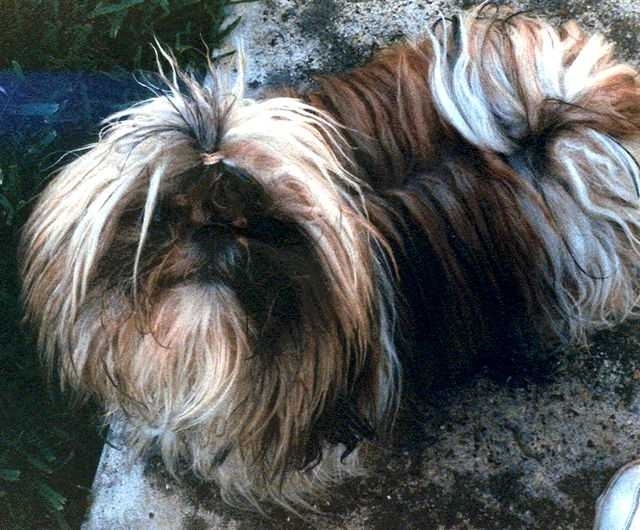 Possible rule-outs included (1) thrombic emboli in the lungs, especially since the dog had some mitral valve issues; (2) adverse reaction to any of the drugs administered; or (3) a neurological disorder. 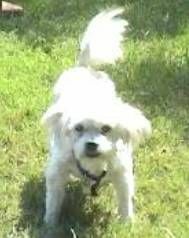 In summary, we cannot conclude that Dr. Thomas' actions contributed to "Stempy's" death or that she did not meet the standard of care of an average veterinarian in Mesquite, Texas. All three reviewers agree on those points. This case will be finally closed to no violation. Highlighted sections indicates what is being responded to in red font by us. With regard to diet, the reviewers note that Hills G/D can be used in dogs where one suspects both oxalate and struvite stone types. Thus, this diet was appropriate where both stone types were implicated at different times. ***MUNSON RESPONSE: Training material will be sent out to the reviewers. Where one suspects both oxalate and struvite stone types, the diet for oxalate TAKES PRECEDENCE, therefore the CORRECT diet should have been Hills U/D. Again, training material will be sent to the reviewers. *** One reviewer notes that he has observed in his practice that no diet will work 100 per cent of the time to prevent stones. ***MUNSON RESPONSE: Oh, really? Well, then, that kind of makes quarterly urinalyses and twice yearly radiographs EVEN THAT MUCH MORE IMPORTANT!!!! The reviewer proves our point. Where is the intelligence in this undertaking on the part of the Board? Is this just a BLATANT cover-up? *** The role of the Hills diet, if any, in the formation of stones in "Stempy" cannot be determined. 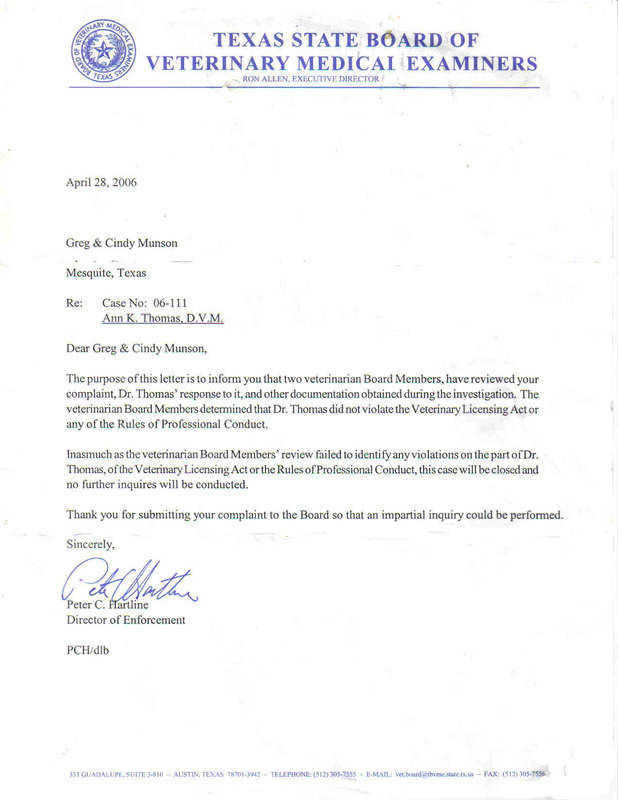 With regard to patient records, we cannot determine if the photocopied records were improperly altered***MUNSON RESPONSE: Then why didn’t the Board request the ORIGINAL records?. Dr. Thomas acknowledges that as a solo practitioner, she often does not have time immediately after surgery or appointments to fully complete the records. 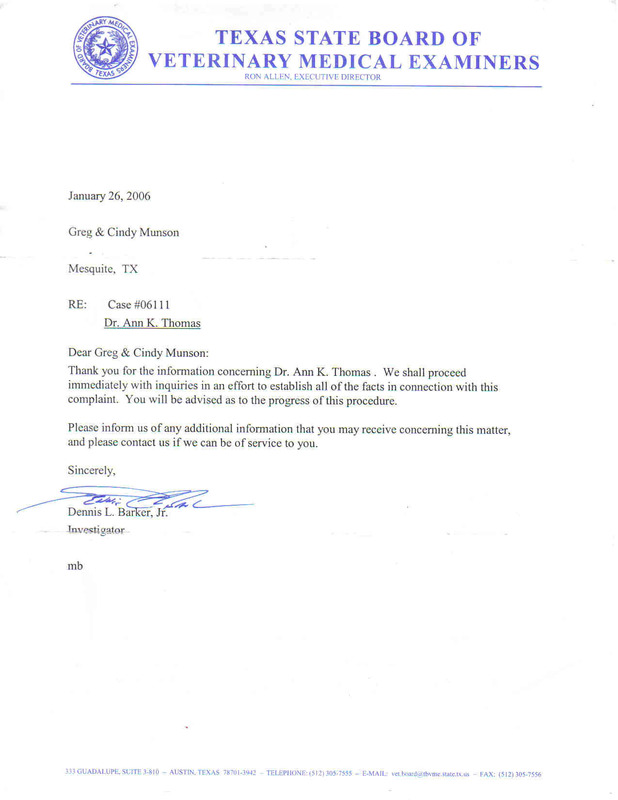 ***MUNSON RESPONSE: That is VERY conducive to forgetting crucial information by not immediately recording what is told during appointments and examinations, SUCH AS FORGETTING BEING TOLD OF STEMPY’S PRIOR SEIZURE/EPISODE HISTORY and NEVER recording it. It is permissible to clarify, correct or add to records after the time of services, as long as there is no intent to falsify them or prepare bogus defenses to possible complaints. ***MUNSON RESPONSE: There is CLEAR intent on the part of Dr. Thomas to falsify them and prepare bogus defenses. As a matter of policy, the Board often encourages veterinarians to maintain complete and detailed patient records. There is no evidence, per se, of improper alteration, and we simply cannot make a finding in this regard. ***MUNSON RESPONSE: With this being SERIOUSLY questioned by the complainant, why would the Board not request the ORIGINAL records? There lies your evidence! Dr. Thomas reported that the surgery was successful. ***MUNSON RESPONSE: The MAJOR issue that the surgery was UNAUTHORIZED is not even addressed. She said she performed a perineal urethrostomy on "Stempy." Actually, she probably performed a urethrotomy***MUNSON RESPONSE: Dr. Thomas is not even knowledgeable enough to know which unauthorized procedure she performed, yet the FACT that she FAILED TO REFER this case to a specialist is not even addressed. since you did not find a permanent opening into the urethra. In any event, the surgery resulted in removing the stuck stone. A radiograph determined that no stones remained. ***MUNSON RESPONSE: No radiograph was EVER taken post surgery. As noted in the records, the only radiographs taken were just immediately prior to surgery, NEVER POST SURGERY. If it’s not in the records, then the Board presumes it DID NOT occur. Isn’t that what the Board is presuming with regards to us telling Dr. Thomas of Stempy’s seizure history? The Board can’t have it both ways, can they? Unfairly and unethically they sure can. 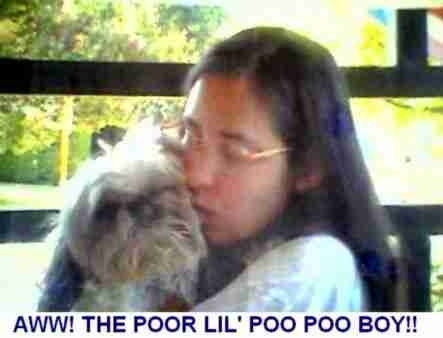 *** The dog's condition was initially satisfactory except for reported pain and restlessness. Acepromazine was prescribed ***MUNSON RESPONSE: Then what justified taking him completely OFF of pain killers and prescribing a tranquilizer that provided absolutely ZERO analgesia? to calm the dog. 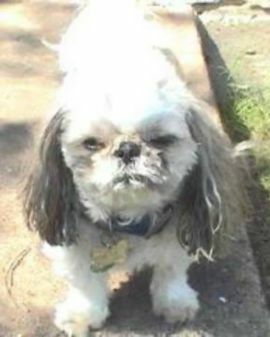 ***MUNSON RESPONSE: He was not excited. He was in SEVERE PAIN! 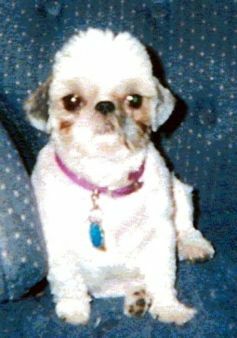 You are correct that this medication should be avoided in animals with a history of seizures or epilepsy; however the issue remains whether Dr. Thomas was aware of the prior history. You say you told her; she says you did not. 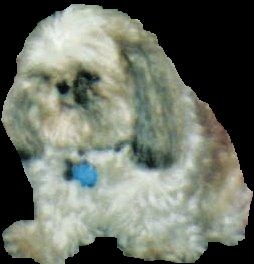 Neither the dog's former patient records or Dr. Thomas' records mention this history. ***MUNSON RESPONSE: Previously addressed. 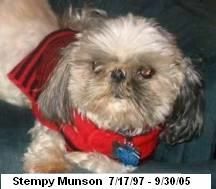 The unfortunate bottom line is that the reviewers do not know why "Stempy" died. A necropsy would possibly have answered this question. Possible rule-outs included (1) thrombic emboli in the lungs, especially since the dog had some mitral valve issues***MUNSON RESPONSE: No tests were ever done. This could very well have been a direct result of an extended urethral obstruction. ; (2) adverse reaction to any of the drugs administered; or (3) a neurological disorder. 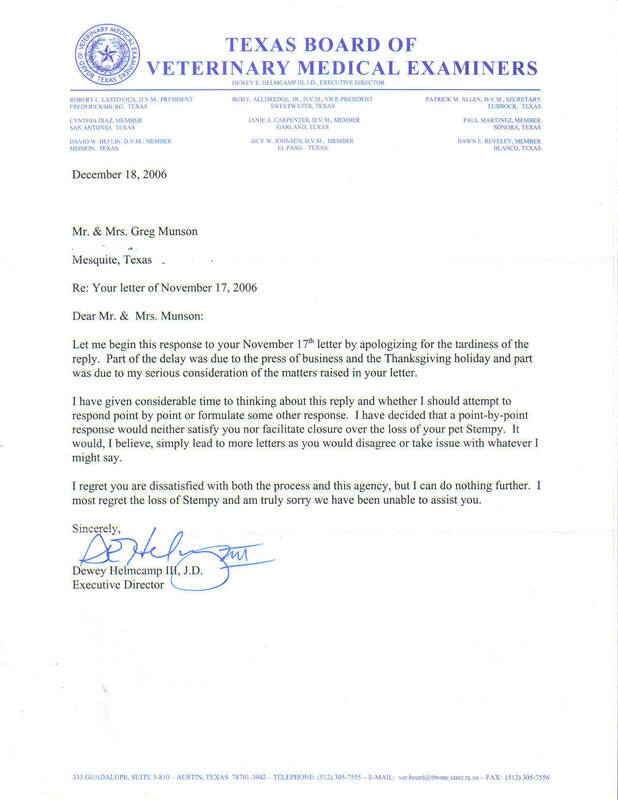 In summary, we cannot conclude that Dr. Thomas' actions contributed to "Stempy's" death or that she did not meet the standard of care of an average veterinarian in Mesquite, Texas***MUNSON RESPONSE: We can…and we do conclude that Dr. Thomas' course of actions caused "Stempy's" death and that she did not meet the standard of care of an average veterinarian in Mesquite, Texas. All three reviewers agree on those points. This case will be finally closed to no violation. ***MUNSON RESPONSE: We STRONGLY feel that the complainant MUST be allowed to communicate DIRECTLY with the reviewers. How else are we to know that our complaints truly receive a thorough and impartial review? We have tons of questions that have been left unanswered. Stempy certainly did not receive a fair shake. That both saddens and infuriates us deeply. This is the investigator who lied about interviewing Cindy. See our reply to this letter on The Appeal page of the website. 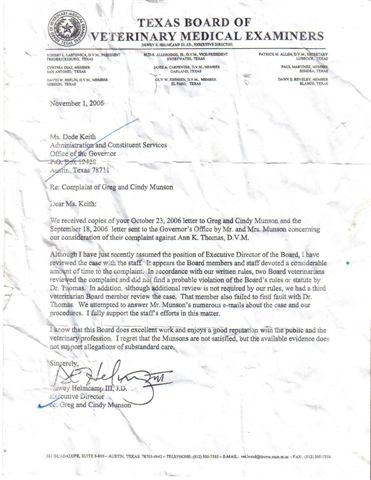 See our reply to this letter "Dismissal Letter" above. "I don't understand. He's saying when their are allegations of improprieties conducted by regulatory agencies, there are established investigative and oversight authorities who can look into them. Your allegations are against the veterinary board. Yet he is referrng your allegations of impropriety back to the veterinary board itself -- the very entity accused of impropriety -- rather than telling you who the "established investigative and oversight authorities" are and referring you to them. In other words, he is refusing to take any action to refer you to state authorities with oversight of the board, and refusing to take action himself, and contacting the very offending organization to warn them that you are trying to get them investigated (which they already know). Did I misread something or is that pretty much the gist of it? " 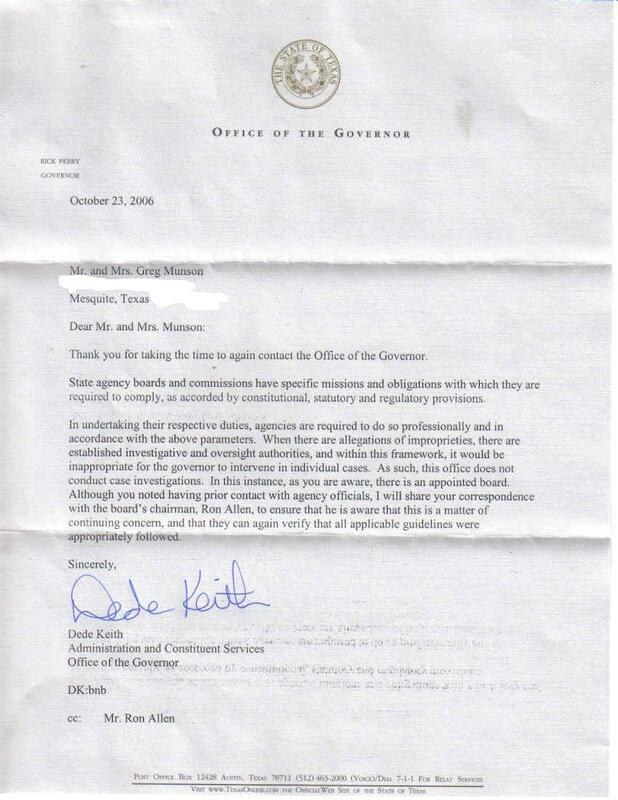 This is the Board's response to the Governor's office. This response was written by Dewey Helmcamp - the new executive director - on his VERY FIRST day on the job. We are supposed to believe that Mr. Helmcamp had several hours to thoroughly review Stempy's complaint on his first day? Come on, we are not stupid. This is ridiculous. 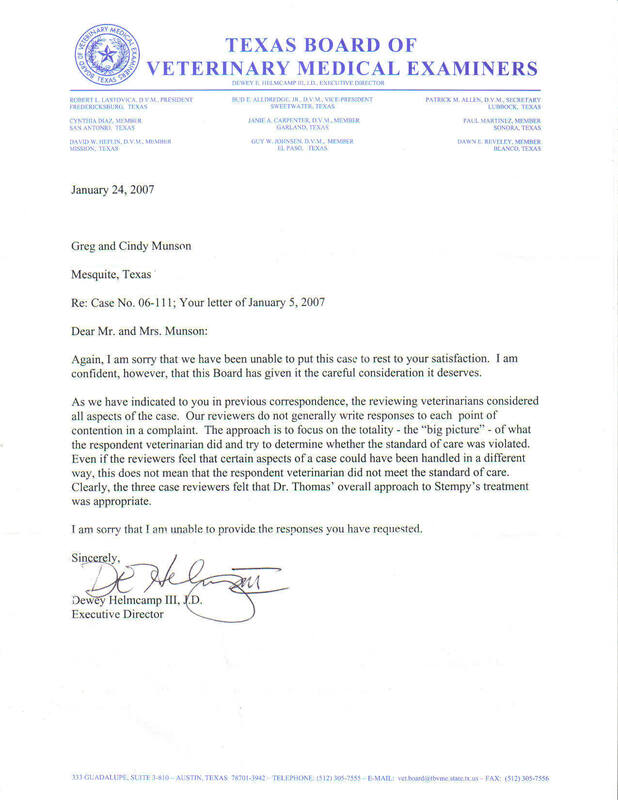 Mr. Helmcamp states, "...the available evidence does not support allegations of substandard care." Well, he must not have been looking at Stempy's case. The evidence of substandard care is overwhelming and it's right here for everyone to see. Looks like the new executive director won't bring about any changes at the "Protect the Vet" Board. Mr. Helmcamp refuses to answer our most basic of questions. Why is that? He does not know how we will respond to his answers. Not one to take "no" for an answer, we responded to this letter by asking, again, for the Board to cooperate and answer our remaining questions. Below is their response. Why is it so hard to answer our remaining questions? We do not understand the Board's refusal to answer.....unless there is something to hide. We will continue to seek the answers to our questions. This Board needs to quit protecting guilty veterinarians! We will not go away. We will not give up. Stempy deserves justice and we fully intend to find it, no matter how long it takes.